One of my favorite things to wear this time of year are oversize sweaters. I love how comfy they are, but that they are still appropriate to wear out during the day. 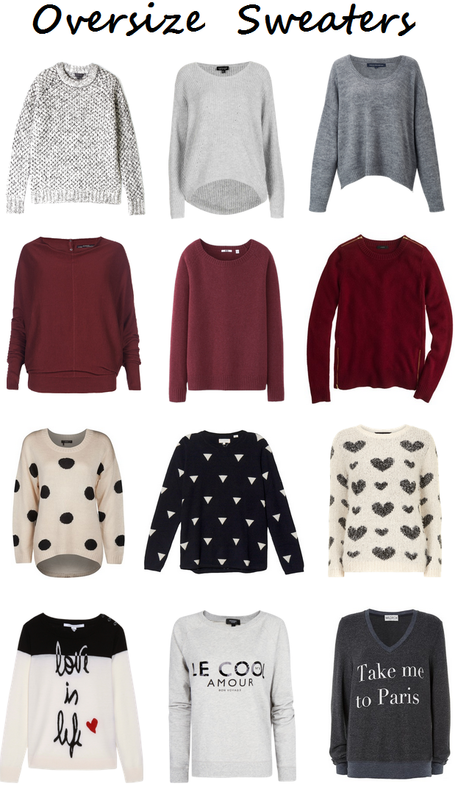 These are a few of my current favorite sweater styles. I have recently been drawn to grey and burgundy colored sweaters. They are great neutral fall colors that can go so well with many different bottoms such as a dark wash jean, leggings, or even a skater skirt. I also like the pattern and sweaters with cute little sayings. My favorite is the DVF "love is life" sweater. © Like Love Style 2011. Powered by Blogger. Blog Templates Created with by BeautyTemplates - Designsrock.